When the temps drop more in September, I’ll be reaching for my favorite Rag & Bone boots – they’re the most comfortable pair that I always pack whenever I’m traveling. I can walk all day in them! I brought my black pair, but I’m thinking I’d get a lot of use out of this newer neutral shade too. It’s a great transitional color, don’t you think? I also realized I’ve never owned a barbour-style jacket. I have a lighter utility-style jacket, but it’s 3/4 sleeve and not very useful in colder weather. I feel like this one is such a perfect, versatile piece – it’s a gorgeous army green hue that’ll look great with my other earthy neutral basics this fall! It also comes in black and burgundy. Great picks for fall! The Rag and Bone boots are a must have. I absolutely love (and live in) my black ones! 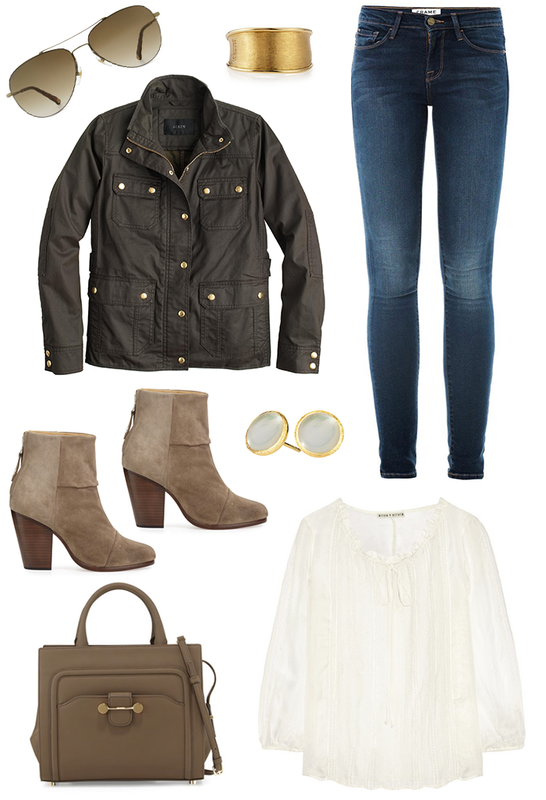 Such a great fall outfit! I have this coat from a couple of seasons ago, and it remains one of my fall staples. It’s such a classic piece. Love these classic pieces! That jacket is a must have! Love the transitional options you provided!